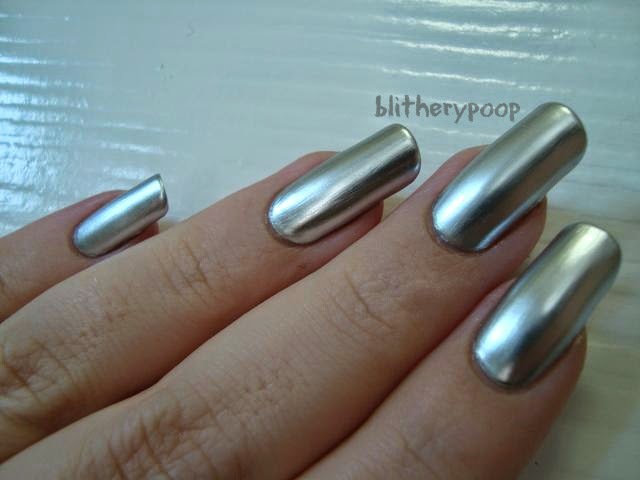 It seems like OPI Push And Shove could wind up being one of those polishes that's gonna keep turning up on this blog. You've already seen it on me and Nichole back when the collection was still new. We both had mixed feelings about it back then. The base coat it comes with, called Lay Down That Base, is just about useless. It doesn't smooth the nail or prolong wear. Results for both of us showed every flaw in our natural nails. I expected to have the same results from Sally Hansen's new Color Foil collection. Then someone on the Nail Board mentioned putting one of the shades on over a previous mani and getting smooth results. It worked! They went on so beautifully over old manis or base and topcoats without color in-between that I had to retry Push And Shove the same way. I applied two coats of Push And Shove over a previous mani, using Lay Down That Base first on just my index and ring finger nails. This test clinches its uselessness, as far as I'm concerned. There's almost no difference between the nails with the base and those without. If anything I think Push And Shove shows a few more brushstrokes over the base than it does when it's just over the older mani without it. Silver is my "power color" in some ways, so I'm delighted to be able to get results like this. I'm probably gonna need a backup bottle just in case. I can see Push And Shove being collectible in the future and I don't wanna wind up paying $20 for it in 2019. My typical pose falls completely flat with chromes, I'll admit. I mixed it up a bit to try to show Push And Shove off a bit better. 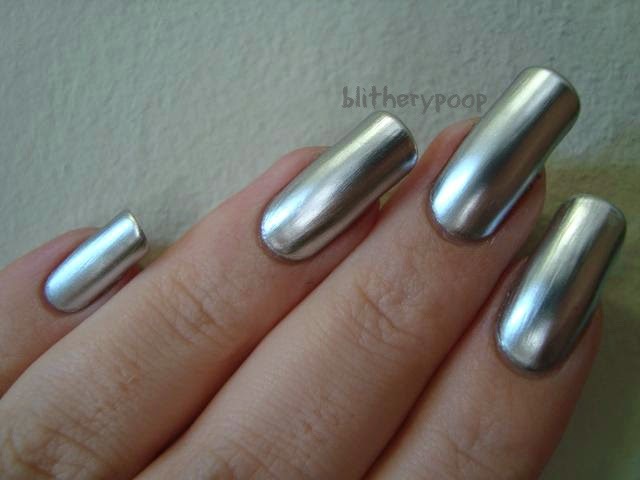 When applied like this, Push And Shove is the most mirror-like polish I've ever worn. It almost looks like appliques or falsies. If you were frustrated with Push And Shove, give this a shot! Oh noes, a lemming hatched!